Revised JJIF Anti-doping rules have been found in full compliance with the new WADA Code, in effect from January 1, 2015. Electronic version of the document is available at the bottom of the page. For more details you might also visit JJIF web site, Anti-doping section (www.jjif.info). In accordance with the WADA rules and the JJIF regulations, the Athletes’ Commission has elaborated an Athlete’s Commitment document (see attachment), which includes the athlete’s anti-doping commitment. Please have all your athletes participating in the World Championship in Paris sign the form and send it back to me and to Ms. Claudia Behnke of the Athletes’ Commission (athletes.jjif [z] gmail.com). Also, please be adviced that since January 1, 2015, all athletes participating in JJIF-recognized events must have such a form signed and sent to me and the Athletes’ Commission. You can send the forms as you obtain them, at your convenience. Information provided by: Dana Mortelmans, JJIF General Secretary At the JJIF Congress held on 27/11/2008 in Malmo Sweden, JJIF accepted the revised (2009) World Anti-Doping Code (the “Code”). These Anti-Doping Rules are adopted and implemented in conformance with JJIF’s responsibilities under the Code, and are in furtherance of JJIF’s continuing efforts to eradicate doping in the sport of JU-JITSU. Anti-Doping Rules, like Competition rules, are sport rules governing the conditions under which sport is played. Athletes and other Persons accept these rules as a condition of participation and shall be bound by them. These sport-specific rules and procedures, aimed at enforcing anti-doping principles in a global and harmonized manner, are distinct in nature and, therefore, not intended to be subject to, or limited by any national requirements and legal standards applicable to criminal proceedings or employment matters. When reviewing the facts and the law of a given case, all courts, arbitral tribunals and other adjudicating bodies should be aware of and respect the distinct nature of the anti-doping rules in the Code and the fact that these rules represent the consensus of a broad spectrum of stakeholders around the world with an interest in fair sport. To consult the WADA 2013 Prohibited List, the 2013 Monitoring Program, a summary of modifications on the 2013 List, and a Q&A on any changes, please click here. List of Prohibited Substances and Methods took effect on January 1, 2014. 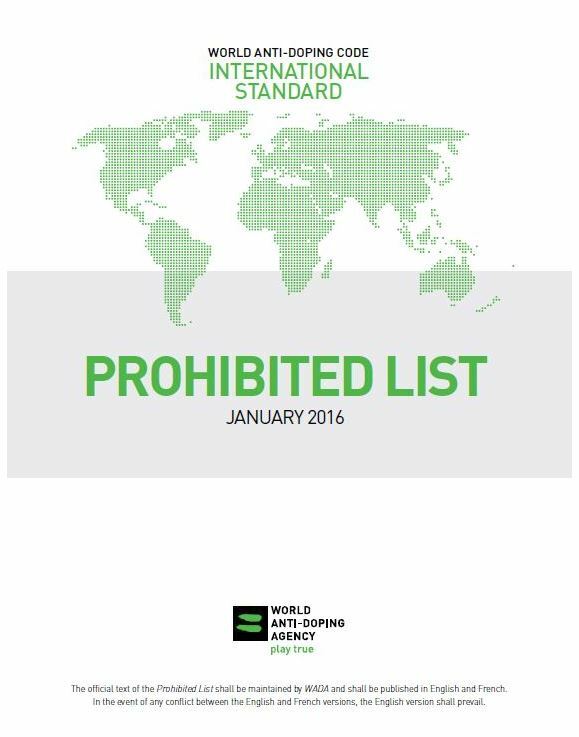 The List – which was approved by WADA’s Executive Committee on September 11, 2013 – can be viewed at WADA’s website or through the free iPhone application. The List can also be accessed using other mobile devices via the mobile site.